There is no single component of training that can comprehensively prepare pilots to mitigate the threat of LOC-I. Academics provide the foundational knowledge to informed decisions and actions in an emergency, but time and psychology do not always allow us access to our full cognitive abilities in an upset event. Practical training is required to be able to safely and effectively employ the All-Attitude Upset Recovery Strategy™ in an emerging or developed airplane upset event. While an all-attitude capable aerobatic certified aircraft provides critical and irreplaceable training in the reality of an actual airplane upset event, the working environment for professional pilots differs greatly from most all-attitude capable airplanes. The transfer of core UPRT skills, practiced during the first day of APS core recurrent UPRT or any other base program, can be augmented through the addition of the Advanced Multi-Engine Jet Simulator Enhancement module. 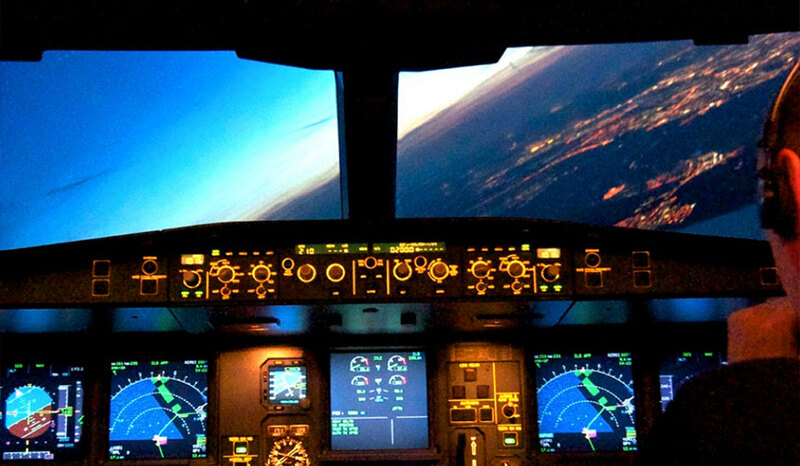 This additional half day of training allows for the practice of core UPRT skills in a multi-engine, two-pilot cockpit environment which is representative of a transport category flight deck. Limitations to visibility, heavier control forces, lower pitch and roll rates, and reduced structural margins can make recovering a transport category aircraft significantly more challenging than a light aerobatic aircraft. Using a variety of Flight Simulation Training Devices, APS teaches pilots how the basic UPRT skills learned transfer to the transport category aircraft. For pilots who have participated in on-aircraft training with APS but have not participated in UPRT in a flight simulator with APS, the Advanced Multi-Engine Jet Simulator recurrent UPRT module can show you the big picture, and how it applies to preventing and recovering from aircraft upsets in your aircraft.